Maximum strength pet shampoo that stops scratching, itching and odor. Works well on Fungal, Bacterial, and Viral Skin Conditions. Veterinarian recommended for use on Dogs, Cats, Kittens, and Puppies. This non-toxic, environmentally friendly formula was developed, in part, by NASA research on the decontamination of Astronauts! Essentially, it combines the correct quality ingredients, in the correct proportions, to create the perfect environment for skin to heal and flourish. Eqyss Micro-Tek Pet Shampoo is concentrated and may be diluted to a ration of 8:1, yet is safe enough to use full strength on open wounds without the worry of burning or pain! For best results apply for at least 2 and up to 5-minutes, then rinse completely. 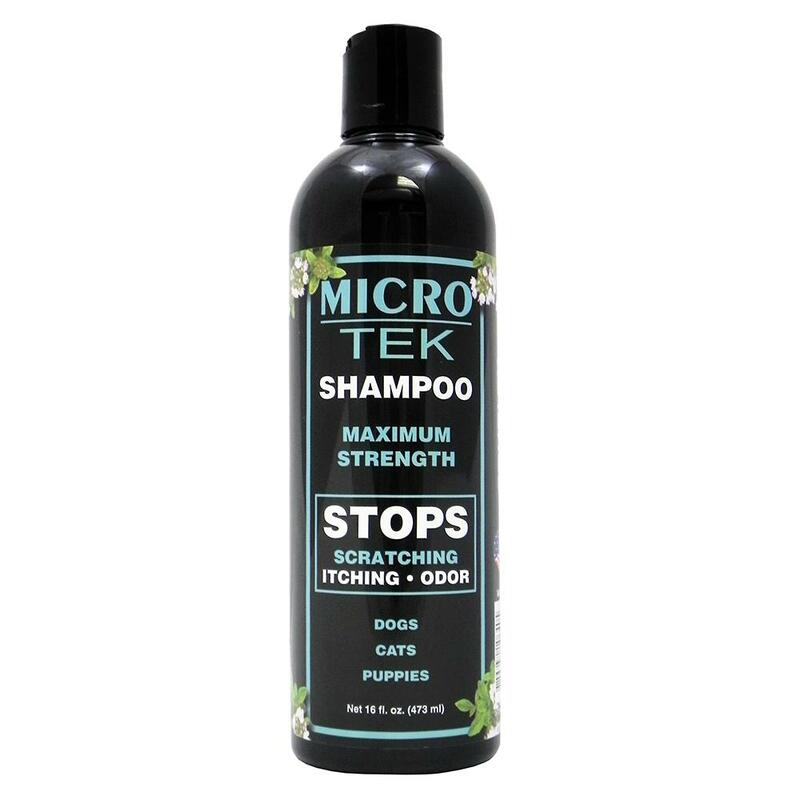 This product is most effective when used in conjunction with Eqyss Micro-Tek Pet Spray, applied after shampooing throughout the day. This shampoo should be used weekly until the problem is eliminated. Deionized Water, Sodium Laureth Sulfate, Cocamidopropyl Betaine, Cocamide DEA, Polysorbate 20, Polysorbate 80, Polyquaternium 10, Allantoin, Sodium PCA, Glycosaminoglycans, Trichlocarban, Aloe Vera, Extract of Clove, Thyme and Lavender, DM DM Hydantoin, Mehtylparaben, Tetrasodium EDTA, Citric Acid, Salt, and Fragrance.